Jefferson, looking towards Las Colinas (background) in Los Santos. Glen Park is also visible in the background to the left. Jefferson is a district slightly to the northeast of the city center of Los Santos, San Andreas, modeled after the residential district of Watts in Los Angeles. It is a stronghold for the Ballas, Grove Street Families and Los Santos Vagos during part of 1992, with the exception of the County General Hospital, as it is used by all Los Santos-based gangs. The area is more of a Poor district, with numerous one-story houses and a few businesses. There are no known residents in Jefferson, although Carl Johnson can purchase a home in Jefferson. North of Jefferson is Las Colinas, while to the south are Idlewood and Ganton. West of Jefferson is Glen Park, while to the east is East Los Santos. Jefferson is a stronghold of the Rollin' Heights Families gang, who use the area as a base from which to attack Ganton, the main stronghold for the Grove Street Families. 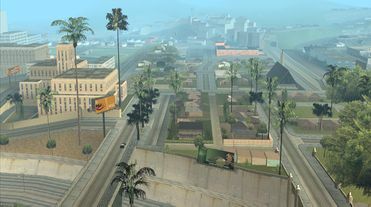 Jefferson plays a small role in Grand Theft Auto: San Andreas, although the mission Reuniting the Families largely takes place in Jefferson. During the mission, the individual families within the Grove Street Families meet in order to call a truce, although the meeting is ambushed by the LSPD. Carl Johnson, Sweet, Big Smoke and Ryder then drive through the area, successfully avoiding arrest. Jefferson, if the player chooses, can become Grove Street Families territory or the player can opt to leave the area in the control of the original Jefferson sets. Jefferson is probably named after Jefferson Boulevard, a boulevard in South Los Angeles. This page was last modified on 26 November 2012, at 20:11.